Late-term abortion and fetal development: My debate with Ann Furedi. Pro-choice and pro-life absolutists say fetal development doesn’t matter. They’re wrong. A month ago, I debated late-term abortion with Ann Furedi, the chief executive of BPAS (the British Pregnancy Advisory Service), at the Battle of Ideas in London. This week, Spiked published a transcript of Furedi’s remarks, prompting outcries from pro-lifers. I’ve been asked what I said in the debate and what I think of Furedi’s view. Furedi opposes any legal time limit on abortion because she thinks the moral significance of fetal development is subjective throughout pregnancy. She’s wrong. In her published remarks, Furedi says there’s no “reason to think that doctors [or] women are abusing the current situation,” since “the number of women who request late abortions is very small,” and “there is no evidence that the number of women requesting late abortions is increasing.” On this, we agree. Late-term abortion isn’t a broad or growing social problem. It isn’t where I’d prefer to focus my energy on reproductive matters. I’d rather talk about contraception. But the debate organizers wanted this topic. And even if the percentage of abortions performed at late stages is low (5 percent occur after 16 weeks, 1.3 percent occur after 21 weeks), that’s still thousands of cases (32,000 after 16 weeks, 8,000 after 21 weeks). We can do better. 3. Brain, spinal cord, and heart begin to develop. 4-5. Brain develops into five areas. Cranial nerves visible. Eye and ear structures begin to form. 6. Nerve terminals and fibers are present deep in skin. 7. All essential organs have begun to form. 8. Nerve fibers grow into spinal cord. Signals from tissue stimulation reach spinal cord. 9-12. Fetus can make a fist. Face is well-formed. Liver produces red blood cells. 12. Connections from thalamus to cortex develop. 13. Internal organs develop nerve terminals that can detect surgical tissue damage. 13-16. Fetus begins to make active movements and sucking motions. 14. Eyes begin to face forward and slowly move. Ultrasound detects coordinated movements. 16. Brain responses to low-frequency noise can be recorded. 18. Fetus withdraws from a needle. It launches a midbrain-generated stress response to needle punctures. This confirms that signals about tissue damage are reaching the midbrain. 19. Withdrawal reflexes and other nociceptive reactions can be recorded. 20. Increase in cortisol, beta-endorphin, noradrenaline when a needle invades the abdomen. 21. Rapid eye movements begin. 22-23. Fetus shows habituation to stimuli, reacts to first occurrence but not multiple repetitions. 23. Startle reflex develops. 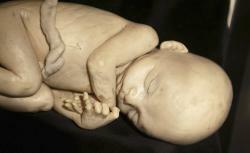 Some fetuses respond to familiar sounds, such as mother’s voice, with movement. 24. Cortex begins to process sensory input, including tissue damage. Air sacs form in lungs. 25-28. Accelerated brain construction. Respiratory development makes gas exchange possible. 26. Auditory cortex begins to respond to sound. Coordinated behavioral responses include facial expressions. Some motions look like scratching, smiling, crying, sucking. 28. Visually evoked responses and spontaneous brain activity of cortical origin are recorded. 29. Clear behavioral responses to smell can be recorded in infants born at this age. 29-30. Pathways mediating pain perception become functional. 33. fMRI shows cortical activation in response to sound. 34. Accelerated brain development. EEG rhythm of the two hemispheres is synchronized. 35. Organs are ready to function on their own. There are some women who would feel that 11 weeks is too late for them, or that 10 weeks is too late for them, because of their personal circumstances. There are other women who, faced with the decision quite late in their pregnancy, will feel that they can no longer bear to carry a child to term. In Furedi’s remarks about women, I saw compassion. But in what she has said and written about human life in the womb (“Is there anything qualitatively different about a fetus at, say, 28 weeks that gives it a morally different status to a fetus at 18 weeks or even eight weeks?”), we have a chilling portrait of subjectivism run amok. No stage of fetal development is meaningful in a way that merits interference in the right to abortion. Spinal cord formation? That’s subjective. Brain construction? Subjective. Coordinated movement? Subjective. Distinctive response to the mother’s voice? Subjective. Pain perception? Spontaneous cortical activity? Viable lungs? It’s all subjective. If, as Furedi says, viability makes no particular difference, then why stop at birth? In our debate, I pointed out that the neural development trajectory outlined in “The Emergence of Human Consciousness: From Fetal to Neonatal Life” doesn’t end at birth. It runs through the first three years of life. If a child’s ability to survive on its own makes no difference, and if neural development adds no binding significance to the fetus’s original dispensability, then who are you to impose your values on Susan Smith, Andrea Yates, or Marilyn Lemak? If a woman feels that eight, 18, or 28 weeks after birth isn’t too late for her, shouldn’t we trust her judgment? This is the madness pro-lifers warned us about. If you don’t draw a line at conception, they argue, there’s no stopping point. Furedi agrees with them: “I accept that abortion stops a beating heart and I accept that abortion ends a potential human life, even in the very earliest weeks of pregnancy. So if we think it’s a morally wrong or morally coarsening thing to do, then I think we should oppose abortion right from the very earliest weeks.” On this fundamental question, pro-choice and pro-life absolutists are allies. They want to flatten the gestational time line. Either you outlaw abortion from conception, as the personhood movement proposes, or you must tolerate it without end. The alternative to this binary dystopia is to take seriously the differences between an eight-, 18-, and 28-week fetus. Those differences are no more subjective than evolution or global warming. And they matter, because the capacities that make a newborn more significant than a zygote—cognition, interaction, viability—don’t materialize overnight. They develop over many weeks. At some point, they make abortion too much like infanticide. If you don’t want to end up in Furedi’s world, you’ll have to decide when that point is. Not just for you, but for anybody.